TALLINN, Estonia -- Ukraine's signing of an agreement extending the lease of a Russian naval base in Crimea does not affect its prospect of eventually joining NATO, NATO Secretary-General Anders Fogh Rasmussen said on Thursday. NATO Secretary-General Anders Fogh Rasmussen. 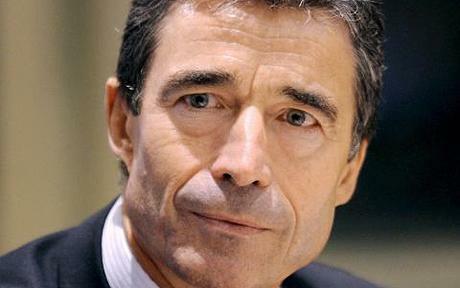 Rasmussen said NATO policies had not changed since it promised Ukraine eventual membership at a summit in 2008. "We stated that Ukraine, and Georgia, by the way, will become members of NATO, provided of course if they so wish and fulfill the necessary criteria. And this is still our position," he told a news conference at a NATO meeting in Estonia. Referring to the base deal, he added: "It's a bilateral agreement and it will not have an impact on our relationship neither with Russia nor with Ukraine." Ukraine's newly elected President Viktor Yanukovich has said membership of the U.S. military alliance is no longer on the agenda and earlier this month he scrapped a state body set up to oversee the country's eventual accession to the alliance. At the same time, he was careful not to close off all cooperation with NATO. Russia agreed on Wednesday to a 30 percent cut in the price of its gas supplies to Ukraine in exchange for a 25-year extension of the lease of its Black Sea fleet based on Ukraine's Crimean peninsula. The concession on the Black Sea fleet was the clearest sign yet of a foreign policy shift by Kiev toward Moscow, which was angered by NATO's promise of membership to Ukraine and Georgia, former Soviet republics it sees as part of its sphere of influence. Despite its promise of eventual membership for Ukraine, NATO has cooled on the prospect while seeking to rebuild ties with Russia damaged by Moscow's intervention in Georgia in 2008. Earlier on Thursday, U.S. Secretary of State Hillary Clinton rejected Russia's claim to a sphere of influence and said Moscow had no right to veto whether a country could join an organization like NATO. NATO SAYS RUSSIA BASE AT SEVASTAPOL DOES NOT AFFECT PLEDGE TO UKRAINE !! THE AGREEMENT BETWEEN UKRAINE AND RUSSIA IS GOOD FROM A PURELY DIPLOMATIC POINT OF VIEW. HOWEVER, ANY SEASONED DIPLOMAT STEEPED IN INTERNATIONAL RELATIONS WILL READILY ASSERT THAT AN AGREEMENT OF AN EXCHANGE OF REDUCED PRICES OF A COMMODITY SUCH AS OIL OR GAS FOR MILITARY OCCUPATION BY A COUNTRY WHICH HAS POSED A SECURITY THREAT TO ONE OF THE COUNTRIES,IN THIS CASE UKRAINE MAY NOT BE A WISE DECISION. ...IT IS LIKE TRADING FOOD FOR AN INSURANCE POLICY AND ONE NEVER KNOWS WHEN THEY MAY NEED THAT INSURANCE POLICY OTHERWISE YOU ARE NOT COVERED.!!! WE MUST REMEMBER THAT ALTHOUGH UKRAINE IS TRYING TO REMAIN GOOD FRIENDS AND NEIGHBORS WITH ITS NEIGHBOR RUSSIA, IT ALSO BROKE AWAY FROM THAT SAME COUNTRY,FORMERLY NAMED THE SOVIET UNION ONLY SINCE 1991 AND FOR VERY GOOD REASONS. AND, FOR THE MOST PART SINCE THE BREAKAWAY UKRAINE HAS FLOURISHED AND ITS CURRENT ECONOMIC SITUATION IS PART OF AN OVERALL WORLDWIDE ECONOMIC SITUATION WHICH IS HAVING AN EVEN WORSE IMPACT ON THE COUNTRY OF RUSSIA WHICH IT MADE THE DEAL WITH. MORE IMPORTANTLY HOWEVER, ALLOWING RUSSIA TO REMAIN WITH ITS LARGE 7TH FLEET FOR MANY YEARS TO COME AT A STRATEGIC LOCATION ON THE BLACK SEA CAN BACKFIRE VERY EASILY DOWN THE ROAD. THE ECONOMIC SITUATIOIN WORLDWIDE CAN CHANGE AND DEMAND FOR SOME COMMODITIES SUCH AS GAS OR OIL MAY BECOME LESS IMPORTANT THAN INTERNAL SECURITY OF THE SOVERIGN SAFETY AND RIGHTS OF THE PEOPLE OF UKRAINE. REMEMBER RUSSIA WAS QUICK TO TAKE BITTER ACTION AGAINST UKRAINES NEIGHBOR GEORGIA AND WITH THE WORLD GEOPOLITICAL SITUATION CONSTANTLY CHANGING IN A NEW CENTURY UKRAINE WOULD HAVE BEEN BETTER TO HOLD ITS GROUND AND WORK OUT A FAVORABLE AGREEMENT WITH RUSSIA BUT NOT GIVING AWAY MUCH TURF FREEDOM. ALLOWING RUSSIAS 7TH FLEET TO REMEAIN ALMOST INDEFINITELY OPENS THE DOOR TO THE NEXT DOOR AND EVENTUALLY THERE MAY BE NO DOORS TO TURN TO. MORE THAN INMINENT AND CAUSES ACTUAL SEIZING OF A COUNTRYS SOVERIGN RIGHTS OF FREEDOM. RUSSIA AND UKRAINE DO HAVE CULTURAL AND OTHER DIPLOMATIC DIFFERENCES WHICH CANNOT BE OVERLOOKED. AND,IT IS GOOD THAT THEY ARE REMAINING FRIENDS AT LEAST FOR NOW....BUT WHEN YOU DEAL WITH RUSSIA ONE BAD DAY CAN BE LETHAL CCOMPARED TO ALL THE GOOD DAYS THE REST OF THE YEAR. AND, OFCOURSE IT CAUSES A SOMEWHAT ADVERSERIAL SITUATION WITH OTHER COUNTRIES IN THE REGION. AS THE OLD ADAGE SAYS...GOOD FENCES MAKE FOR GOOD NEIGHBORS. WHEN DEALING WITRH RUSSIA GOOD FENCES MAY MAKE FOR GREAT NEIGHBORS AS RUSSIA PLAYS A GREAT GAME OF CHESS. WES RODGERS AMERICAN-UKRAINE CORRESPONDENT...patriotstv.com..THEPHILADELPHIA BULLETIN..